Real-world data is also increasingly supporting the things I have seen and heard. David Wilcock, who interviews me on Cosmic Disclosure, published a comprehensive overview of this case, and its provable evidence, as of June 19th. The final update section of the article emerged just minutes before he flew out to Colorado for another round of Cosmic Disclosure tapings, and is required reading for anyone who is following this story. My intel had indicated that a war is taking place between positive and negative extraterrestrials and other Earth-based groups, and that shoot-downs were going to be increasingly common. These would lead to visible phenomena. This intel was almost immediately validated by the events outlined in David’s article. The key players in our story include the Cabal, a group many people call the “New World Order”. Unbeknownst to most people, the Cabal is being very effectively opposed by a group of alliances, both on earth and in the Secret Space Program. Their financial and political control of our planet is being systematically overthrown. The Earth Alliance groups include a significant percentage of the US defense and intelligence community who are fighting for the good. This includes a wide variety of computer hacks that are already exposing hidden truths. We are also hearing that massive data dumps could occur in the future that will expose the public to Full Disclosure – including the wrongdoings of the Cabal and the truth of the Secret Space Program. Ultimately the Cabal was created and run by negative extraterrestrials, including a reptilian group known as the Draco. The humans in the Cabal are not shape-shifting reptilians, as biological life does not have this ability. However, certain Cabal members do have telepathic connections to these beings that some intuitives will see as a reptilian overlay on their faces. This accounts for the many cases David Icke has reported on in his earlier works. The Draco are a conquering race, and Tompkins’ new testimony revealed that they contacted the Nazis not just to hopefully subdue the Earth, but to create an army that could be used to conquer many other worlds as well. The Nazis had the mentality and industrial know-how that the Draco wanted, and began colonizing space with the technology the Draco gave them in the late 1930s. The United States was developing its own space program due to assets it had acquired, but did not succeed to anywhere near the degree that the Germans had. Ultimately the US was bullied and blackmailed into joining the German SSP, and their hope was that they would be able to take the program over and squash the Germans. Unfortunately, the opposite took place – at least for many years. The level of technology in the SSP dwarfs anything we have on Earth, and includes replicator devices, teleportation, time travel, anti-gravity, free energy and healing technologies that make all forms of disease, illness and even aging obsolete. These technologies would transform our society into a true Star Trek age overnight. These assets already exist in our skies and we simply are not being allowed to see or use them, thanks to the Cabal and their overlords. However, an ever-increasing column of resistance has developed in the SSP that we are calling the SSP Alliance. Though my formal work in the SSP finished in 1987, I was recently contacted by a new group of powerful extraterrestrials and this led to me being brought back in – upon their own direct request. This new group was originally called the “Sphere Beings,” since they arrived in a magnificent array of gigantic spheres – some of which were as large as the planet Neptune in diameter. Although the first sphere appeared in the 1980s, they didn’t begin showing up in larger numbers until the late 1990s. Another major influx appeared right around the Mayan Calendar end-date of 2012. The spheres refused to communicate with the SSP or the SSP Alliance in any way, causing great concern and mystery. I began working closely with David Wilcock as of October 2014, after our original written contact had started five years earlier. Although David was initially skeptical about my experiences and claims, he soon realized I was validating dozens and dozens of specific data points he had heard from other insiders. I was also quite astonished at how much he knew and had not publicly revealed about the SSP. This information was being held back so he could find out who was real and who was a fraud. David meticulously wrote down everything I said in real time as I was speaking, which grew into a 150-page, single-spaced document by late February 2015. We are now beginning the process of turning this into a published book and will update you as it progresses. David was also sharing the contents of this document with key people at the Gaia television network who had earned his trust. David gave an initial “leak” of the data I was giving him, along with data from others, at his Conscious Life Expo talk that same February. This created quite a stir in the insider world and led to me being threatened, though I had not given him most of the intel he shared. Shortly after we went public with this information, the “sphere beings” finally communicated with the SSP Alliance. They asked for me by name. I was brought up at the beginning of March 2015 and introduced to key people in the Alliance through my contact Lt. Col. Gonzales, who the sphere beings had also been in touch with. The beings who facilitated this meeting had already contacted me in the past. They were humanlike but also possessed bird-like features, including blue and purple feathers, and thus were called the Blue Avians. The two beings I had the greatest interaction with called themselves Ra-Tear-Eir and Ra-Rain-Eir. The first word “Ra” was pronounced almost like the word “Raw”. The Blue Avians refused to communicate directly with the Alliance, but ended up using me as their messenger in this first meeting. 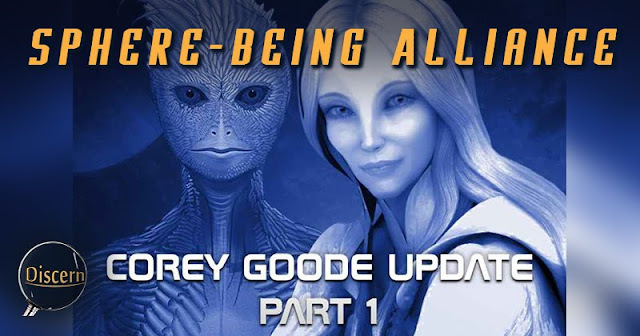 They stood behind me, along with another type of being we simply call the Golden Triangle-Headed Beings, and communicated answers to the Alliance’s questions by speaking directly into my mind. I then reported the answers as meticulously as possible. To read the rest of the article, click below.